A proposed pipeline extension two years in the making drew fresh ire from environmental groups earlier this year with the U.S. State Department and Environmental Protection Agency (EPA) butting heads over potential environmental risks. The Keystone XL pipeline expansion project would almost double U.S. imports of Canadian tar sands oil—carrying up to 700,000 extra barrels per day of partially refined bitumen, a heavy, viscous form of petroleum found in tar sands over the border. Keystone XL would be a sister pipeline to the existing Keystone project which currently carries diluted bitumen from Canada’s Alberta province to refineries in Illinois and Oklahoma. 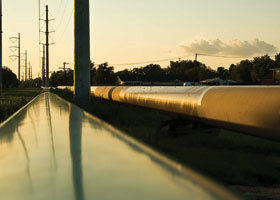 The XL line would take a different, mostly U.S.-based route on its way to refineries near the gulf coast of Texas. Though the pipeline proposal has been on the table since 2009, the process stalled after the EPA gave the State Department’s environmental assessment report for the project a failing grade in 2010. A second assessment was undertaken in April of this year, but that, too, fell short of the EPA’s standards. Now, environmental groups are using the momentum to bring attention to their concerns over the pipeline project. E caught up with Alex Moore, dirty fuels campaigner for Friends of the Earth to get an insider view on their environmental concerns. 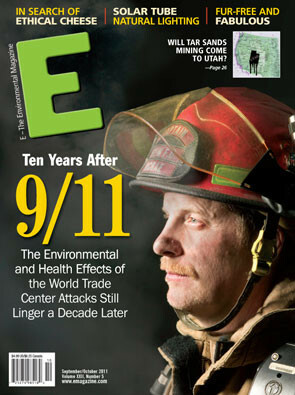 E Magazine: What are some of Friends of the Earth’s concerns with the proposed Keystone XL pipeline expansion? Alex Moore: We have concerns with Keystone XL from the top to the bottom. We’ve been opposed to development of the tar sands project in Canada. We see it as an example of how bad our addiction to oil has gotten—that we are now extracting oil from one of the most dirty oil deposits in the world, polluting water and polluting air, and exacerbating climate change. We shouldn’t be building a new pipeline to expand our addiction from this really dirty source of energy. So that’s the “top” end of why we don’t think any route makes the pipeline environmentally safe. But [pipeline operator] TransCanada has also chosen a route that would have particularly bad environmental consequences along the way, and they’ve been skirting safety which is going to put people at risk. E: As it now stands, the pipeline would cross many populated areas, several major waterways and a large aquifer. Are there any alternate routes this pipeline could take? A.M.: The major environmental groups would say there’s no route that’s a good route or an environmentally safe route. But some of the people in Nebraska have suggested that TransCanada should just follow the same route of the existing Keystone line, for which they already have a right-of-way. It would go around the Sandhills region [of Nebraska]. But TransCanada has been dead set against that and the State Department has supported them. E: Why is the pipeline’s proposed route through the Nebraska Sandhills an issue? A.M.: The Nebraska Sandhills is a very unique ecosystem with sandy forest soil, and the Ogallala aquifer—the nation’s biggest aquifer—is very shallow in this area, sometimes even coming up to the surface. And this will be a buried pipeline, so it will literally be within the aquifer, making even small spills really scary. Especially because small spills are especially hard to detect. E: Why would TransCanada choose this path through the Ogallala aquifer if it poses such dangers? A.M.: If you look at the map, it’s pretty clear they decided “we’re gonna build this the shortest distance between two points,” which is cheaper for them. But you have everyone from your average environmentalist to your super-conservative senators like Mike Johanns of Nebraska saying this is the worst route you could have chosen through Nebraska. E: How much of a problem are leaks for pipelines like this? TransCanada says they have a pretty well-wrought safety system in place. A.M.: Pipelines are probably less safe than the average person thinks. What’s interesting is that [the first Keystone pipeline, which is only about a year old], was issued a corrective action order from the Department of Transportation [earlier this year]—and this [has] never happened with a pipeline that’s less than a year old. Frankly, what I hear from TransCanada is that they repeat that Keystone is the safest pipeline ever built, despite all evidence to the contrary, and won’t really engage any of the safety concerns that people have. E: The evidence you’re talking about is the 12 leaks the existing Keystone pipeline has sprung to date, including one in North Dakota this past May that released 21,000 gallons of oil (roughly 500 barrels) before it could be contained. What’s the major worry when something like this happens? A.M.: I think some sort of fitting broke at the pumping station in the North Dakota case and oil was spraying 60 feet into the air. Luckily, there was no body of water next to it—it wasn’t near a river or somewhere that would make it truly disastrous. But still, you’re going to have a lot of things in the diluted bitumen that are volatile compounds that will gas off. So you’ll have toxic substances in the air, some of which are carcinogenic, like benzene. And that’s a danger to anyone who lives nearby or any workers who are going to be cleaning up the spill. And you also have the standard issues with animal or plant life that come in contact with the oil—it’s going to be smothering those organisms. And it can potentially get into ground water. E: This pipeline would carry bitumen into the U.S. for refinement rather than already distilled petroleum. What difference does this make? 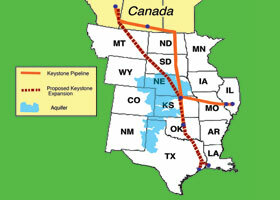 A.M.: Keystone XL was proposed as a dedicated bitumen pipeline, like the first Keystone. Bitumen, or tar sands oil, is worse because it’s thicker, but also it’s more corrosive and more acidic [than refined oil]. To make it flow they have to pump it at high pressure and they have to fix it with volatile natural gas liquids to be able to make it less viscous. So you have very corrosive, very thick, very acidic, high heat oil flowing through this pipeline. E: And that makes for greater potential for spills? What happens if there are bitumen spills along waterways? A.M.: The huge spill last year on the Kalamazoo River in Michigan spilled nearly a million gallons of oil that was diluted bitumen. That shows not only is it more likely to spill, but it shows us the danger if it does spill. That river was closed down for a 40-mile stretch [as of July 2011]. That wasn’t the Keystone line, it was a different one, but it still shows us the dangers of a bitumen spill [along a waterway]: You have the dangerous chemicals gassing off, but you have the thick oil settling to the bottom, so it becomes very hard to clean up.